Last week, I started a small series of articles looking into the draft history of the Packers since 2000 for their first-round selections. I covered 2000-2005 last week, and this week’s piece will cover the next five seasons, 2006-2010. In a year that was dominated by players in the 2006 Rose Bowl (five players from USC and three from Texas went in the first two rounds), Green Bay found itself in a position not common to them: picking in the top-five. After Mario Williams, Reggie Bush, Vince Young and D’Brickashaw Ferguson (one of my all-time NFL names) went off the board, Green Bay had a decision to make. A.J. Hawk was sitting right there for them to take, which would add him to their linebacking group currently headlined by Nick Barnett and Brady Poppinga. Another area that the team could have improved on the defense was safety, as Michael Huff from Texas was a top-10 prospect. But with Nick Collins manning one safety slot and Charles Woodson moving to the other safety position, Huff’s production would have been limited. Hawk had arguably his best season as a rookie, with 120 tackles and two picks while starting every game. He produced five 100-plus tackle season in his nine seasons in Green Bay. In hindsight, the team could have also chosen Vernon Davis, who went a pick later to the 49ers, but Hawk’s contributions helped shore up a defensive unit for many years to come. In the comment section of last week’s article, reader ‘Lare’ said that they “can’t wait until you (meaning me) get to Justin Harrell.” Well, we are here. Close to one of the biggest drafts in the 2000s for the entire league, Harrell had an illustrious career in Green Bay, lasting all of two seasons, 13 total games and two wrongly-earned starts. Harrell amounts to Ted Thompson’s biggest flop, as he even was worse than what Ahmad Carroll provided the team in his short stint in Titletown. I am not saying I am any bit athletically gifted, but I have a funny feeling that I could have at least given Green Bay 28 tackles across two seasons. My lack of production would have been understood though; his, not so much. So in lieu of wasting a selection on this type of production, let’s look into who the pick should have been used on instead. Even without knowing about the career-ending injury that Nick Collins would suffer, the team should have looked into defensive backfield help, which could have been addressed by selecting Eric Weddle. Weddle went 37th to San Diego and carved out a solid career there, now in Baltimore. On offense, offensive tackle Joe Staley or tight end Greg Olsen would have been great additions to help Aaron Rodgers in his career development as well, so the options were endless for the team. Needless to say, the selection of Harrell really put a black eye on Thompson’s player scouting resume. In 2008, Green Bay traded out of the first round (30th overall) with the New York Jets and, in turn, received the 36th selection and a fourth rounder, 113th. This added to their pick allotment, as they now had three second-round picks to work with. With their first selection in the second round, Thompson went with Nelson, a receiver out of Kansas State who put up modest numbers and then broke out his senior campaign, amassing 1606 yards and 11 touchdowns. The other second-round selections were awful, as Brian Brohm (remember when ESPN believed he was going to be better than Rodgers) and Pat Lee (who did absolutely nothing and was yet another corner that didn’t pan out for Thompson) were the other two selections for Green Bay. It is safe to say how the Nelson selection turned out, as his impressive GB career just came to an end this offseason. If I had to make a selection of someone else for this pick, I would say that Matt Forte (44th) or DeSean Jackson (49th) would have sufficed as well. This draft was one of the best in recent memory, as Thompson went against everything we knew about him and traded back into the first round to make two second-round selections in 2009. Raji was a stud in his brief career for Green Bay but ultimately didn’t last as long as one would hope. In his six seasons, he was a solid lane clogger, and his best season was 2010 when he had 39 tackles and 6.5 sacks, both career highs. Raji went out on his own terms, saying that he needed to take time off to be with his family and has no plans of returning, as of a March 2017 ESPN report. For Matthews, his career has been a bit up and down the past few years but nonetheless has easily justified his selection. He has been in no less than 11 games every season, starting at least nine in each. 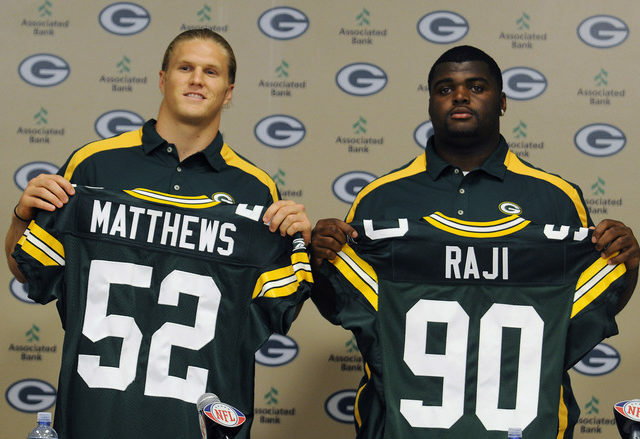 I believe that the Raji selection at the time was justified and I still don’t have an issue with it. But, with the current circumstances with him being out of the league, there are a few selections that Green Bay could have made instead, Malcolm Jenkins (14th) or Brian Cushing (15th). Jenkins would have solidified the corner ranks for GB, while Cushing (even with his injury history) would have brought the USC linebacking teammates together in Titletown. In the team’s infamous title run, Bulaga was brought in to help solidify the offensive line, and even with a bit of injury history, he has fulfilled that need in Green Bay. Going into his ninth season, Bulaga is facing a bit of skepticism that he can come back from his ACL tear that limited him to only five games last season. But with the current status of GB’s offensive line, barring any injuries/trades, Bulaga should be starting come Week 1. Bulaga wasn’t a flashy pick, but he has carved out a solid role for GB since being drafted. However, that year’s second round seemingly was one of the more solid rounds recently, as there is one prospect who I would have rather had, Rob Gronkowski. Selected 42nd, Gronk’s reputation- both on and off the field- speaks for itself. He would have been a great weapon, and just think how much of the Brady vs Rodgers hoopla would be deadened if ARod was able to throw to Gronk (advantage Rodgers, easily)? Hope you enjoyed the second part of this running series! If you have thoughts about this piece or upcoming picks, please let me know in the comments! You might even be mentioned in my article! This entry was posted in Mike Johrendt, NFL Draft and tagged A.J. Hawk, B.J. Raji, Bryan Bulaga, clay matthews, Green Bay Packers, Jordy Nelson, justin harrell, NFL Draft. Bookmark the permalink.